7 Stylish Items That Can Be Worn In Both Desi & Western Ways! When we wake up every morning, the outfit we choose can actually make our day better than what it’s already looking like. Some mixing, some styling, and you’re ready to conquer the day! Feel like a floral kurta with leggings, or maybe a short sundress? What about a tunic with denims? We can pick up a variety of different western and Indian silhouettes to make our wardrobe more exciting and hatke! Here are some clothes you’ve stocked that you can style differently than in the usual ways! Image Source: Aditi Rao Hydari On Instagram Don’t store the black overcoat to wear only in winters to match your pants or dresses. 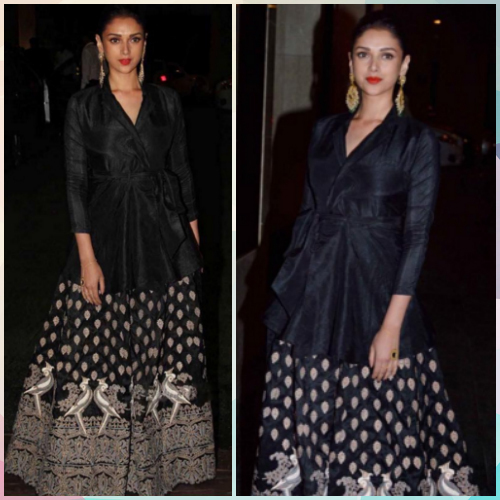 Aditi Rao shows us how we can take that black jacket & pair it with an ethnic skirt. Pick silks for the lowers to add that rich feel and finish the look with some gorgeous ethnic earrings. Ta-da! You’ve got your fusion game bang on! Image Source: Shaleena Nathani On Instagram You’ve got some long kurtas piled up in your cupboard, which you only team with palazzos on days you feel like wearing ethnic! Transform the look into something so grand by pairing your long kurta that has front open/side slits with distressed denims, some pumps, and a fancy hairstyle! Deepika’s wonderful look is making us want to try this soonly! 3. The Extravagant Maxi Dress! Image Source: Karisma Kapoor on Instagram This has to be our favorite Indo-western look! We’ve all got fancy maxi dresses that we’ve bought and not worn them, because they were so OTT. Don’t you worry, child! 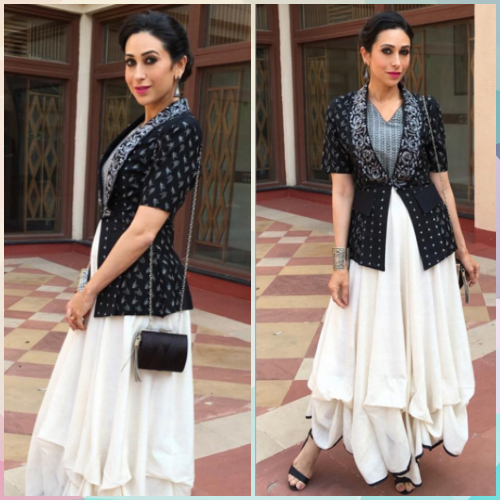 Get your tailor to stitch you a jacket or a waistcoat in pure traditional prints or fabrics to get Karisma’s vibe. Round it off with a pair of cuffs and some intricate earrings! Image Source: Sanjana Batra On Instagram Ever thought of wearing your sequin party top with a sharara or a skirt to a mehendi function? Top it with a shiny jacket or shrug and you’re gleaming like a superstar! Quite a different silhouette to try, and Shilpa Shetty inspires us to go for it. You could also match it with dhoti pants to get a funky look. Image Source: Shraddha Kapoor on Instagram Yes, they are trendy! Everyone is showing off their midriff while matching a crop top with a high-waist skirt or pants. 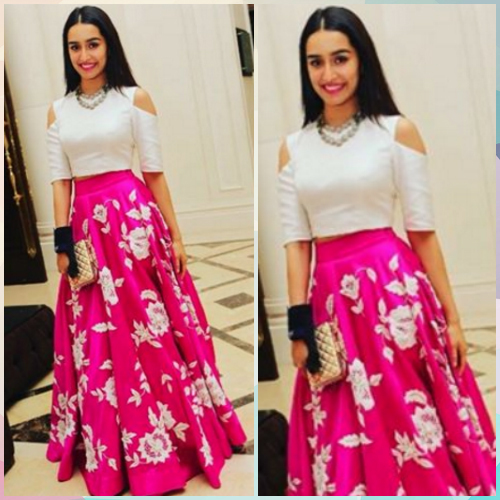 But Shraddha Kapoor shows us how to get that ethnic twist while wearing the same lycra crop top we all own, with a beautiful embroidered skirt. All the flounce topped with some traditional jewellery can look pretty amazing, we say! Image Source: Karisma Kapoor On Instagram We’ve got that one formal pant that we love wearing to official events, but imagine wearing those on a everyday basis. Ditch the boring and wear those well-fitted pants with structured kurtis and tunics. Get uneven hems, lots of drama, and finish it with a clean pair of heels and a smart clutch. Oooh, we dig this sophisticated touch! 7. The Comfy Tunic Dress! Image Source: Alia Bhatt On Instagram Don’t be shy to wear your tunic just by itself. We generally match this with patialas or leggings. Instead, pick something that doesn’t have slits and wear it as a dress. Even if the look is fairly conventional, pairing it with classy oxfords or brogues can give it a complete makeover. Carry a stylish bag with fringes or any other catchy detail and you’re on a roll! HAVE A STORY IDEA FOR POPxo? If you want to hear about it, we can write about it! Just tell us your idea here! MUST-READ: 9 Indian Brands That Fulfil ALL Your Western Wear Needs! 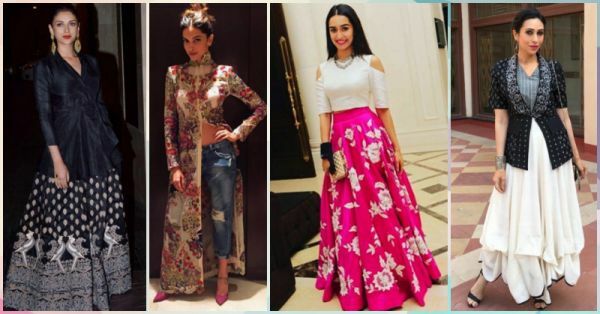 MUST-READ: 9 “Hatke” Fashion Commandments To Steal From Our FAV Stars!